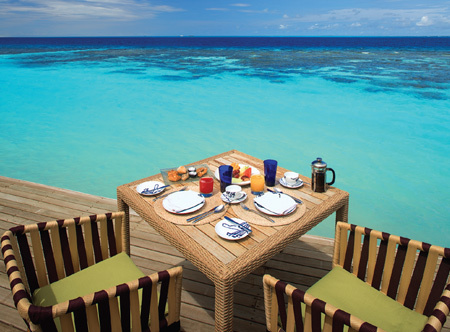 Renowned for its exotic house reef nestling close to the shoreline, this vibrant resort is all about relaxation and enjoying the beautiful surroundings and five star service. 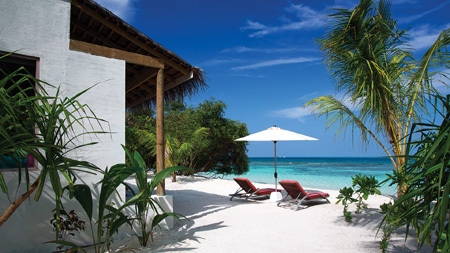 There is plenty to do both on land and within the Indian Ocean; indeed, this is a diver's paradise. 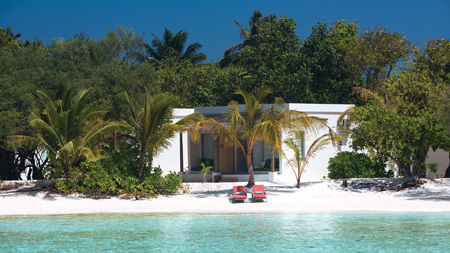 Each villa showcases trendy colourful interiors which are fused with tropical Maldivian designs and ample outdoor space. We recommend booking early to avoid disappointment! 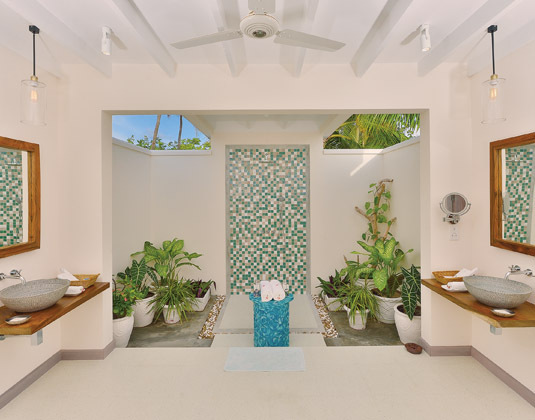 In semi-detached beach villas with open-air bathroom with rain shower, mini fridge, safe and veranda..
Deluxe beach villas which offer direct beach access. 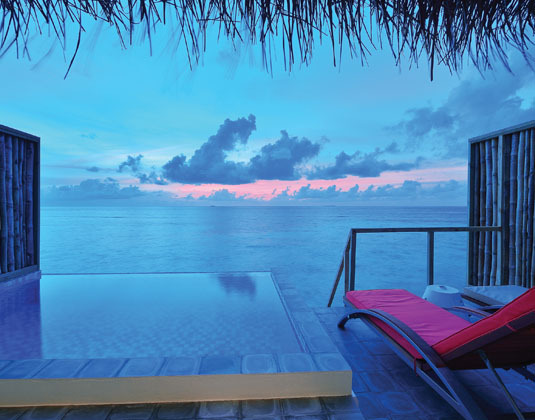 Exclusive lagoon villas with plunge pool which are built half on land with a deck opening into the serene turquoise lagoon offering spectacular sunset views from the bedroom. 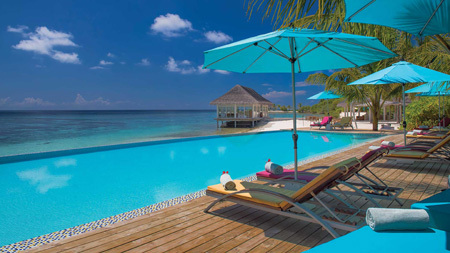 Spacious two bedroom beach suites with pool which offer one master bedroom and separate twin bedroom. 50 minute speedboat transfer from Male airport (operating 24 hours a day). Buffet breakfast, lunch and dinner all at main restaurant *selection of spirits (whisky, gin, vodka, rum), selection of cocktails, house wines (red & white), 2 beer options, mineral water, soft drinks, pre-packed juice, tea & coffee from main bar (open 9am-1am)*in villa mini bar stocked daily with non-alcoholic carbonated drinks and mineral water*sunset finger food service (4pm-6.30pm)*use of stand up paddle boards, kayaks and pedalos*one sunset fishing excursion *one local island excursion to nearby inhabited island. Early booking 5% room discount: On selected dates between Aug-Oct 18. 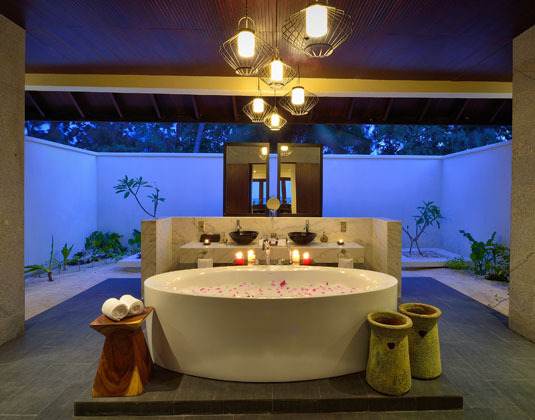 Honeymoons: Aug-Oct 18 if you stay at least 5 nights receive a couples massage at the spa. 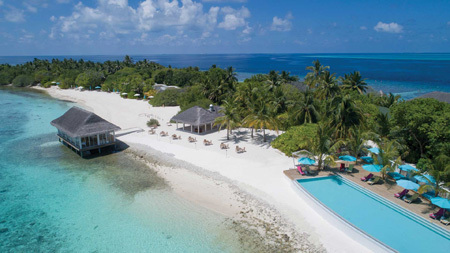 Offering a wide range of accommodation at one of the best dive spots in the Maldives.